Hundreds of flavone-like pigments are widely distributed among plants. On the basis of their chemical structure, these pigments are grouped in several classes, the most important of which are listed in Table II. The basic structure of all these compounds comprises two benzene rings, A and B, connected by a heterocycle. The classification of flavonoids is based on the nature of the heterocycle (which is open in one class). Most of these pigments are yellow (Latin, flavus). One important exception is the anthocyanins, which display a great variety of red and blue hues. Because of the strong visual impact of anthocyanins on the marketing of fruits and vegetables, these pigments will be discussed in greater detail than other flavonoids. The name of these pigments was originally coined to designate the blue (kyanos) pigments of flowers (anthos). It is now known that not only the blue color, but also the purple, violet, magenta, and most of the red hues of flowers, fruits, leaves, stems, and roots are attributable to pigments chemically similar to the original "flower blues." Two exceptions are notable: tomatoes owe their red color to lycopene and red beets owe theirs to betanin, pigments not belonging to the anthocyanin group. 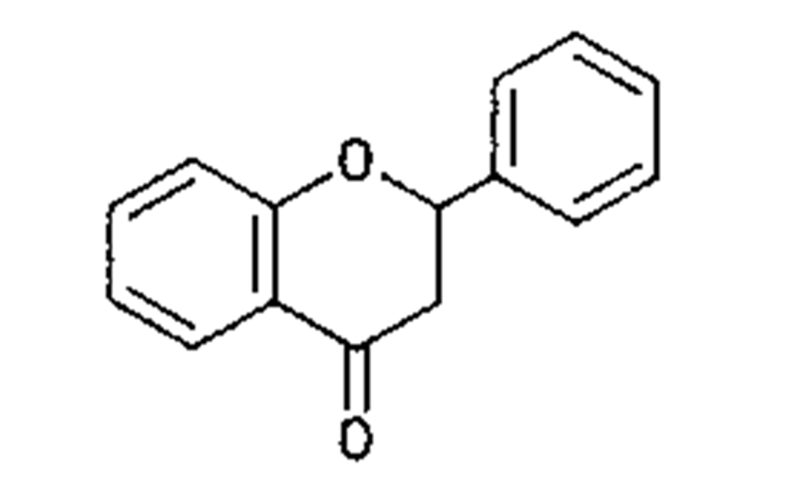 Anthocyanins are glycosides of anthocyanidins, the latter being polyhydroxyl and methoxyl derivatives of flavylium. The arrangement of the hydroxyl and methoxyl groups around the flavylium ion in six anthocyanidins common in foods is shown in Fig. 4. There are at least 10 more anthocyanidins in nature, practically always appearing as glycosides. The number of anthocyanins far exceeds that of anthocyanidins, since monosaccharides, disaccharides, and at times trisaccha-rides glycosylate the anthocyanidins at various positions (always at 3, occasionally at 5, and seldom at other positions). Eventual acylation with p-coumaric, caffeic, and ferulic acids increases the number of natural anthocyanins. An example of acylated anthocyanin is the dark purple eggplant pigment delphinidin, 3-[4-(p-coumaroyl)-L-rhamnosyl-(1 ^ 6)-D-glycosido] 5-D-glucoside. The color of anthocyanins is influenced not only by structural features (hydroxylation, methoxylation, glyco-sylation, acylation), but also by the pH of the solution in which they are present, copigmentation, metal complexa-tion and self-association. The pH affects both the color and the structure of an-thocyanins. In very acidic solution, anthocyanins are red, but as the pH rises the redness diminishes. In freshly prepared alkaline or neutral solution, anthocyanins are blue or violet, but (with the exception of certain multiacylated anthocyanins) they fade within hours or minutes. 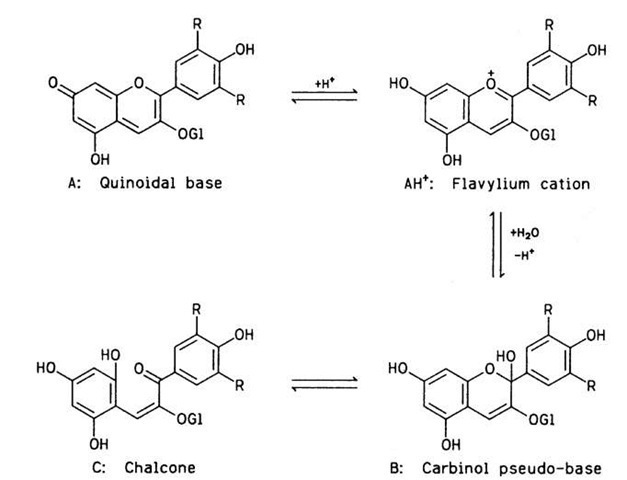 In acidic solution four molecular species of antho-cyanins exist in equilibrium: a bluish quinoidal (or quinonoidal) base A, a red flavylium cation AH+, a colorless carbinol pseudo-base B, and a colorless or yellowish chalcone C (Fig. 5). 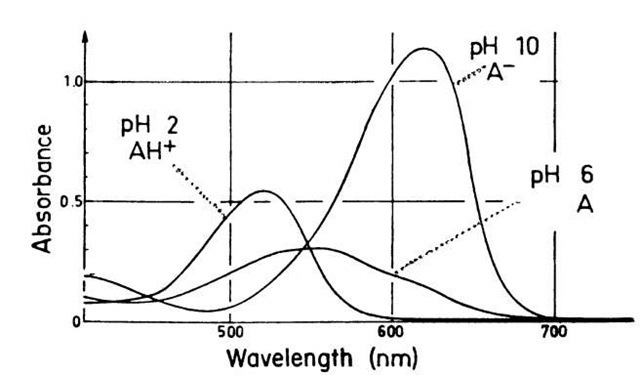 At very low pH (below 1), the red cation AH+ dominates, but as the pH rises to 4 or 5, the concentration of the colorless form B increases rapidly at the expense of AH+, while forms A and C remain scarce. In neutral and alkaline solutions, the concentration of base A rises and its phenolic hydroxyls ionize, yielding unstable blue or violet quinoidal anions A- (Fig. 6). Although it is true that the reaction of most plant tissues pigmented with anthocyanins (fruits, flowers, leaves) is slightly acidic, pH alone cannot explain the vivid colors encountered in these tissues. One mechanism leading to the enhancement and stability of anthocyanin coloration is copigmentation, that is, the association of anthocyanins with other organic substances (copigments). This association results in complexes that absorb more visible light (they are brighter) and light of lower frequency (they look bluer—the bathochromic effect) than the free anthocyanins at tissue pH. Most of these copig-ments are flavonoids, although compounds belonging to other groups (e.g., alkaloids, amino acids, nucleotides) can function similarly. A stacked molecular complex between an acylated anthocyanin and a copigment (flavocommelin) is shown in Fig. 7. FIGURE 4 Six anthocyanidins common in foods. The electric charge shown at position 1 is delocalized over the entire structure by resonance. Self-association is the binding of anthocyanin molecules to one another. It has been observed that the complexes absorb more light than the sum of the single molecules. This explains why a 100-fold increase in the concentration of cyanidin 3,5-glucoside results in a 300fold rise in absorbance. FIGURE 5 Four anthocyanin structures present in aqueous acidic solutions: R is usually H, OH, or OCH3. Gl is glycosyl. Certain anthocyanins form complexes with metals (e.g., iron, aluminum, magnesium), and the result is an augmentation of the anthocyanin color. At times the complexes involve an anthocyanin, a copigment, and a metal. A large number of the anthocyanins present in fruits and vegetables have been identified. It is not unusual for a plant tissue to contain several anthocyanins (17 in certain grape varieties), all genetically controlled. Table III shows the anthocyanidin moieties of anthocyanins in common fruits and vegetables. Generally, the attractive color of anthocyanin-pigmented foods is not very stable. Canning of red cherries or berries results in products with considerable bleaching. Strawberry preserves lose one-half of their anthocyanin content after a few weeks on the shelf, although the browning reaction may mask the loss. And red grape juice is subject to extensive color deterioration during storage. FIGURE 6 Absorption spectra recorded immediately after dissolving an anthocyanin (malvin chloride) in buffers of pH 2, 6, and 10. The absorption peaks at pH 6 and 10 disappeared within 1 to 3 hr. 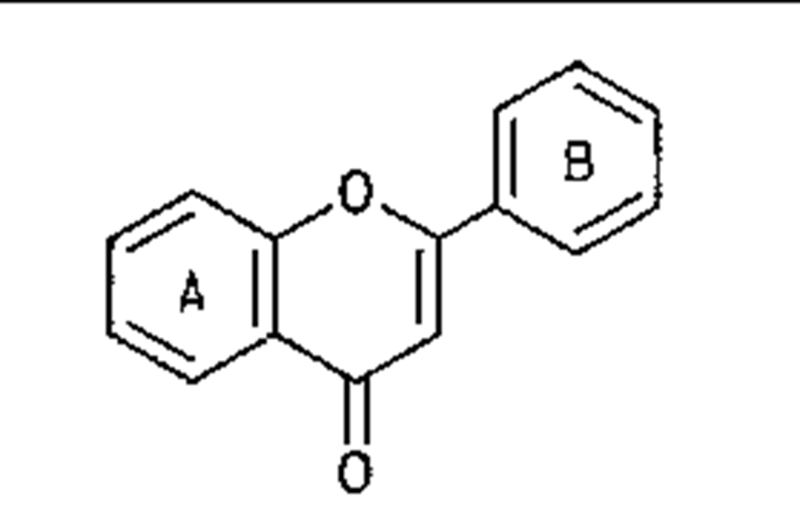 FIGURE 7 Stacked molecular complex of awobanin and flavo-commelin; p-C. denotes p-coumaroyl. Exposure to high temperatures and contact with the oxygen of the air appear to be two factors affecting antho-cyanin stability most adversely. Ascorbic acid accelerates the destruction of anthocyanins, and so does light. Certain oxidizing enzymes, such as phenol oxidase, and a hydrolyzing enzyme known as anthocyanase may contribute to the degradation of anthocyanin pigments. Oxidizing enzymes act on the anthocyanidin moiety, while anthocyanase splits off the sugar residue(s); the freed an-thocyanidin is very unstable and loses its color spontaneously. Sulfur dioxide, which is used for the preservation of some fruit products (pulps, musts), bleaches anthocyanin pigments, but on heating of the fruit prduct in vacuum the SO2 is removed and the anthocyanin color reappears. Large concentrations of SO2, combined with lime, decolorize anthocyanins irreversibly and are used in the preparation of maraschino cherries. Anthocyanins act as anodic and cathodic depolarizers and thereby accelerate the internal corrosion of tin cans. It is therefore necessary to pack anthocyanin-colored products in cans lined with special enamel. In aging red wines anthocyanins condense with other flavonoids and form polymeric (MW < 3000) redbrown pigments (Fig. 8). On continued polymerization these pigments become insoluble and form sediments in bottled red wines. Anthocyanins possessing more than one acyl group show extraordinary color stability over a wide pH range. 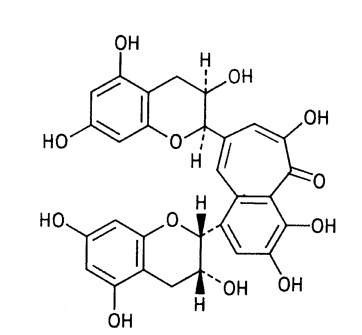 One of them, peonidin-3-(dicaffeyl sophoroside) 5-glucoside, isolated from ‘Heavenly Blue’ morning glory flowers (Ipomoea tricolor), has been shown to "produce a wide range of stable colors in foods and beverages which have a pH range of 2.0 to about 8.0." United States patent 4,172,902 covers its use as a colorant in foods. Among flavonoids other than anthocyanins, the catechins, flavonols, and leucoanthocyanidins have the widest distribution in foodstuffs, while flavonone glycosides are of special interest in citrus fruits. 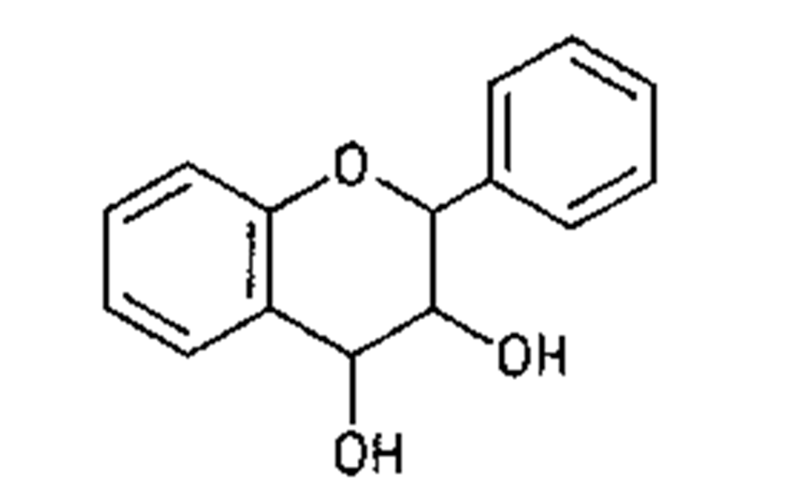 Catechins, or flavan-3-ols, are present mainly in woody tissues. Among common foods, tea leaves contain at least six catechins representing about 25% of the dry weight of tea leaves. 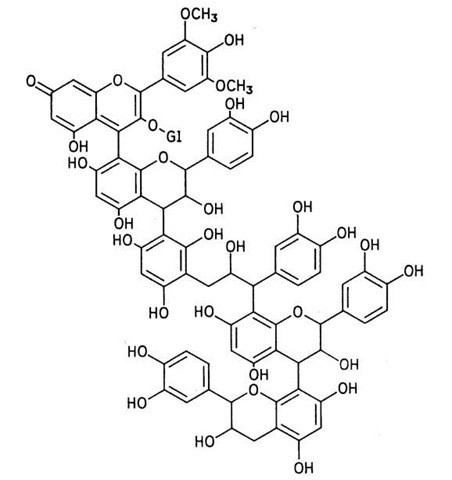 Tea catechins are excellent substrates for the catechol oxidase that is present in tea leaves and participates in the conversion of green tea to black tea. The reddish brown color of tea brew is due to a mixture of pigments known as theaflavins and thearubigins. The structure of one of them is shown in Fig. 9. FIGURE 8 Proposed structure for a polymeric red-brown pigment in aging red wine. 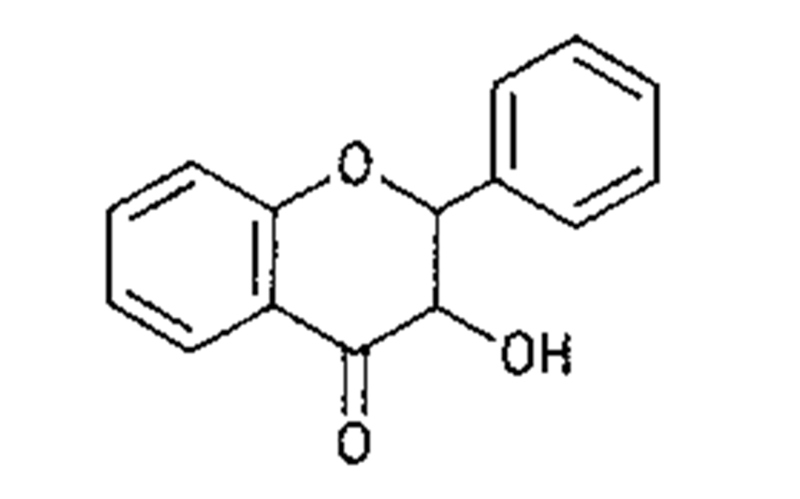 Flavonols, like anthocyanidins, exist almost exclusively as glycosides. 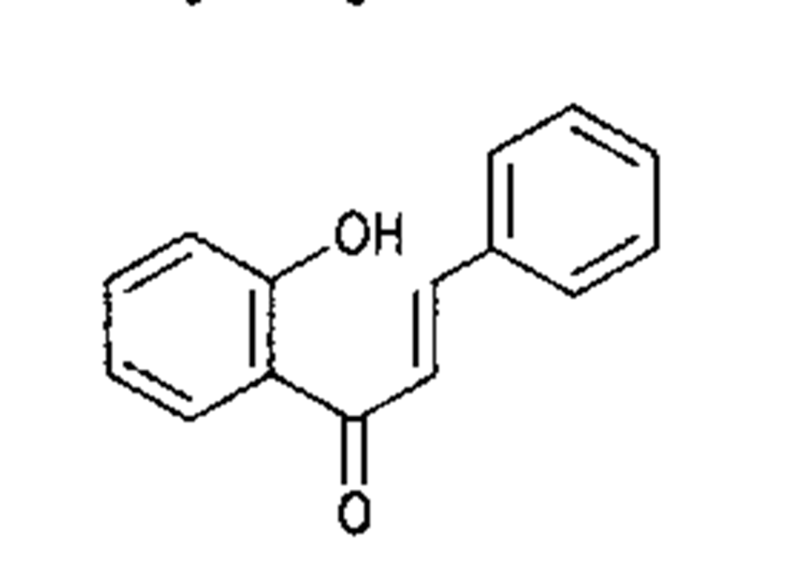 Three common flavonols are kaempferol, quercetin, and myricetin, resembling pelargonidin, cyani-din, and delphinidin, respectively, in the hydroxylation pattern of the B ring. Flavonol glycosides impart weak yellow hues to apples, apricots, cherries, cranberries, grapes, onions, plums, potatoes, strawberries, tea, tomatoes, and other commodities. Leucoanthocyanidins are compounds of the general formula 1 shown in Fig. 10. They have no color of their own, but in acidic environments and at elevated temperatures they are converted to colored anthocyanidins (2). This reaction is in competition with the condensation to a dimeric leucoanthocyanidin (3). Low temperature favors the formation of the dimeric compound, which can polymerize to yield products with pronounced tanning properties. FIGURE 9 Structure of theaflavin. 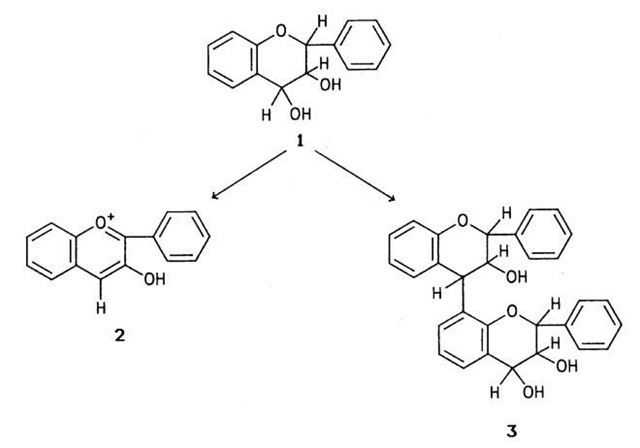 FIGURE 10 Basic structures of leucoanthocyanidins (1), anthocyanidins (2), and dimeric leucoanthocyanidins (3). The most common leucoanthocyanidins are leu-copelargonidin, leucocyanidin, and leucodelphinidin, which are converted to the corresponding anthocyanidins. This conversion results in the undesirable "pinking" of certain products such as canned pears, canned banana puree, processed brussels sprouts, and beer. On the other hand, polymerization to tannins leads to astringency and the formation of haze in beer (insolubilization of beer proteins). 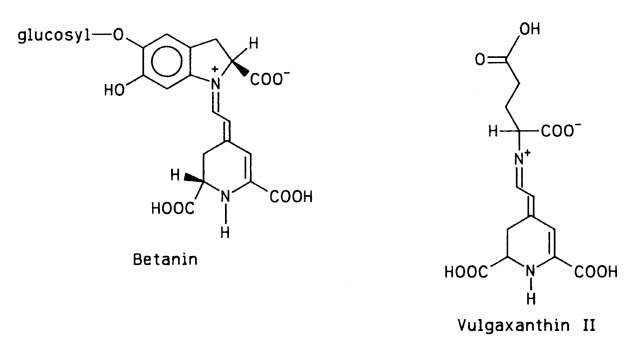 Betalain is a relatively new term used to describe a class of water-soluble plant pigments exemplified by the red-violet betacyanins and yellow betaxanthins. (In a parallel fashion, flavonoids comprise the red-blue anthocyanins and the typical yellow flavonoids that some authors call anthox-anthins.) Betalains owe their name to the red beet (Beta vulgaris), from which they were originally extracted, and they are not as widely distributed as flavonoids. Other foods containing betalains include chard, pokeberries, and Indian cactus fruits. The major red pigment of red beets is betanin, and their major yellow pigment is vulgaxanthin (Fig. 11). FIGURE 11 Two major pigments of red beets. Betalains are stable in the pH range 3.5-7.0, which is the pH range of most foods, but they are sensitive to heat, oxidation, and light. There are several hundred additional natural pigments that are not as widely represented in foods as the previously discussed coloring substances. Among them are the quinones and xanthones, which are yellow pigments. An example of a quinone is juglone, which is present in walnuts and pecans. 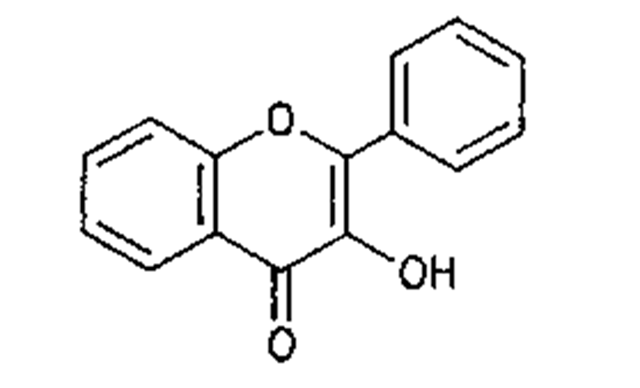 Mangiferin, a representative of xan-thones, is found in mangoes. Tannins include two types of pale yellow to light brown compounds, characterized by their property to convert animal hides to leather. One type consists of condensed tannins, to which reference was made in relation to the leucoanthocyanidins, and the other type comprises hydrolyzable tannins, which are esters of a sugar, usually glucose, with gallic acid, ellagic acid, or both. 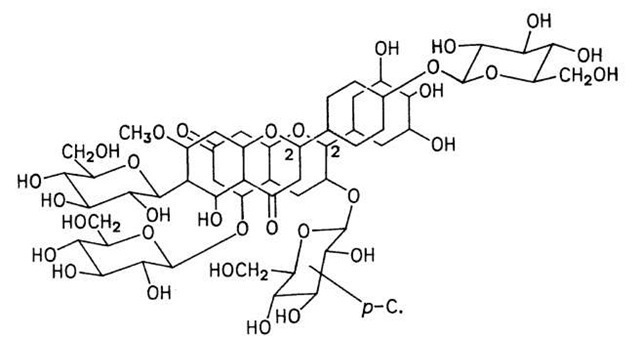 Corilagin is an example of a gallotannin, in which glucose is esterified with three gallic acid molecules. A yellow pigment that has attracted much attention because of its toxicity to humans and nonruminant animals is gossypol. It is present in cottonseeds, which are used as animal feed and have been considered a potential source of protein for human use. Several biologically very important food constituents are colored, such as phytochrome (yellow), vitamin B2 (riboflavin, orange-yellow), and vitamin B12 (red), although their contribution to food coloration is negligible.